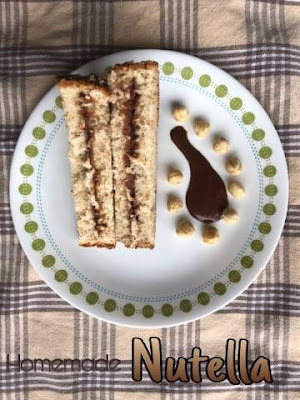 Nutella - Me and my kids are a very big lover of this snack. Yes, its a snack for us, whenever our sweet bud tickles us, this will be our craving and even its our tea-time snack. But somehow thought to stop because of Palm oil addition and its addiction. Kids was keep on asking whenever we do our shopping so thought why not try at home. Now its comes for your review now. Take a mixie jar, add all the ingredients one by one and grind it for 5 to 7 mins, until it comes to smooth paste. Enjoy with toasted bread and any wraps. You can also use brown sugar or honey. If you have crystal sugar, run it in blender to fine powder and then use it. Instead of hazelnut, you can also use roasted peanuts.